Hanita is 22 year old singer-songwriter who has recently finished her 2 year sentence at MICA, Ahmedabad. Deciding that the corporate rut isn't for her, she's finally giving her all to her passion for music. Her songs can be best described as poetry in motion that can be best experienced in person. This set came about for their pure love of progressive music. With the idea of stripping down songs from Karnivool and Porcupine tree and other giants, to give an acoustic, spaced out minimal arrangement of these songs, to other classics from jazz standards to Blues and RnB. A Keys/Guitar and Voice set up to look forward to and let's not forget 'em crazy vocal harmonies! Karan Mahajan is a musician, composer and guitar player based in New Delhi, India. He studied formally at the Global Music Institute (2014- 2016). 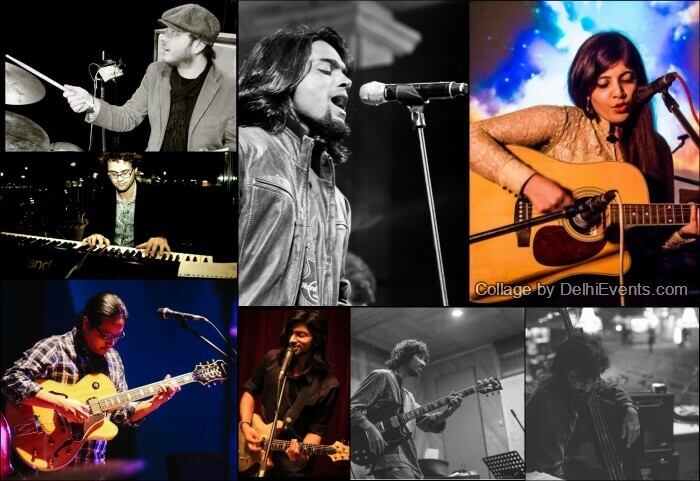 Pallavi is a vocalist based in Delhi. She's found her love in genres such as Soul, RnB and A cappella. Born and brought up in New Delhi, Siddharth Jain has had an interest in Drums from a very early age. Lenart Altgenug (PIANO) has worked as a composer for several short films, including the films entitled Anton and Gameboy, which were featured on the Netherlands Film Festival 2014. Gameboy also won the Topkapi award 2014 for best fiction film. Matteo Fraboni Official (DRUMS) graduated in jazz arrangement and composition from G.B Martini Conservatory of Bologna, Matteo learnt drums and percussion in Cuba with Changuito, in Africa with Mamadou Diouf and took private lessons from Ari Hoening, Nate Smith, Gene Jackson, Paul Motian, Bill Stewart and Brian Blade in New York. Pranai Gurung (GUITAR) is undoubtedly one of the finest guitarists in the city, he has been writing and collaborating with various musicians for over 15 years. Abhinav Khokhar (BASS) is one of the finest bass players that the city of New Delhi has to offer. He has been collaborating and writing with musicians from various genres of music for almost five years now and is fluent with various forms of music. Catch some of Delhi's finest jazz cats and some wonderful travelling musicians meet and converse in the universal language that is Jazz!